In high paced business climate, manufacturing and other industries focus their attention to offer good services to customers. Manufacturing, service and agriculture are the major economic activities in any nation. Statistical figure indicated that in India, manufacturing and services together constitute nearly 75% of the GDP. Service industries effectively responded to global competition by identifying that existence in the business field is dependent upon reconstructing their operations to deliver better, faster and cheaper (Knod and Schonberger, 2001). Theorists like Johnston & Clark (2001) stated that product and service design involves satisfying customer needs into product and service requirements, formulating quality goals and cost target, documenting specifications, refining existing products and services, and developing new ones as well. With these, product and service design can influence a large proportion of an organization's functional area, especially the marketing and operations area. Services are defined as all activities associated with operational services regardless of whether they are executed by the service provider, a third party supplier or by users and customers. 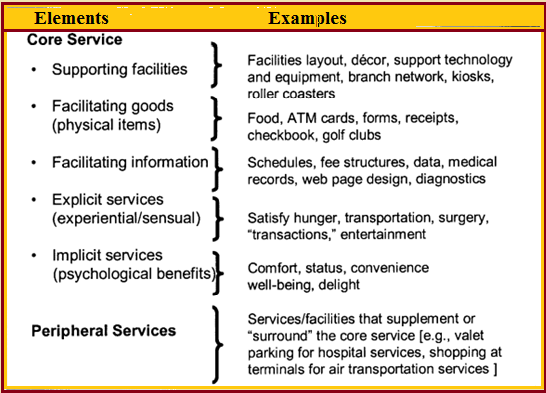 Sasser et al coined the term "service concept", in which they defined as "the total bundle of goods and services sold to the customer and the relative importance of each component to the customer" (1978). Its value lies in bringing together the various elements of the service such as the operational elements, marketing emphasis and customer requirements to produce a meaningful overarching service definition in sufficient detail to provide a working service specification. Originally, the total service package included three elements such as facilitating goods, the explicit services and implicit services. After that this concept is modified many times. Services operations management is related with delivering service to the customers of the service. It involves understanding the service needs of the target customers, managing the processes that deliver the services, ensuring objectives are met, while also paying attention to the constant improvement of the services. As such operations management is a central organizational function and one that is critical to organizational triumph. Service organisations react to the wants of customers and leave certain experiences in the minds of the customer through a service delivery system. It was found in research study that growth of service industry is rapid at global level. Service organization is one when two or more people are engaged in systematic efforts to provide services to customers. These organizations exist to serve customers and satisfy their need (Wright, 2004). Functions of service operation are to restore the normal service to the user as quickly as possible. There is service desk that made up dedicated number of staff responsible for dealing with variety of services events, often made via telephone call, web interface or automatically reported infrastructure events. Wight (1999) identified that key attribute of marketing strategy of service organization is the interaction between the customers and the organization itself. Factors such as high consumer contact, consumer participation in the process, labour intensiveness, intangibility of output, difficulty of measuring quality, difficulty of measuring productivity, and a site dictated by consumers' location, are some of the explanatory characteristics of service operations. Therefore, service quality must identify what sensual benefits, physical items, and psychological benefits the customer is to receive from the service (Watt, 2007). Key objectives of service operation are to synchronize and perform the activities and processes required to deliver and manage services at agreed levels to business users and customers. Service operation is also responsible for on-going management of the technology that is used to deliver and support services. Management scholars sated that highly designed and well implemented processes will be worthless if day to day operation of those processes is not suitably conducted, controlled and managed, nor will service improvements be possible if day to day activities to monitor performance assess metrics and gathering data are not systematically conducted during service operation. There are numerous factors in implementing service operation. Service Organizations must perform a feasibility study first. Service operations are mainly associated with efficiency, effectiveness, Quality and Cost. Dimensions of service quality are Reliability, Responsiveness, Assurance, Empathy and Tangibles. Request fulfilment: Request fulfilment is the process to deal with service requests via the Service Desk, using a process similar but separate to that of incident management. Request fulfilment records/tables are linked, where necessary, to the incident or problem records that initiated the need for the request. 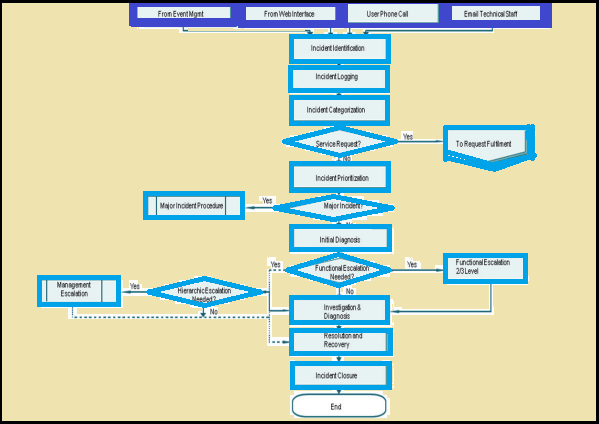 Major aims of the request fulfilment process to provide a channel for users to request and receive standard services for which a predefined approval qualification process exists, to give information to users and customers about the availability of services and the procedure for obtaining them, to source and deliver the components of requested standard services and help with general information, complaints or comments. It effectively decreases the bureaucracy involved in requesting and receiving access to existing or new services, thereby reducing the cost of providing these services. Incident management: Incident management is highly noticeable to companies and it is easier to demonstrate its value than in most areas of service operation. 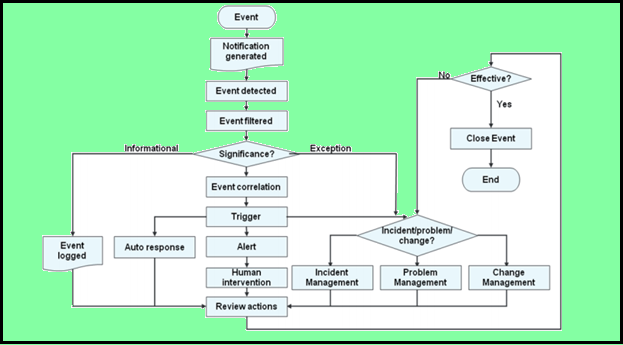 Incident management is often one of the first processes to be implemented in service management projects. The major benefit of doing this is that incident management can be used to high spot other areas that need attention, thus providing a reason for implementing processes. The purpose of incident management is to reinstate normal service operation as quickly as possible and diminish the adverse impact of the Incident on business operations, thus ensuring that the best possible levels of service quality and availability are maintained. Problem management: This is vital for companies. Problem management comprises of the activities required to identify the root cause of incidents and to determine the resolution to the problems. It is also responsible for ensuring that the resolution is implemented through the appropriate control procedures. Effective problem management stops the recurrence of incidents and has benefits to the individual and the organization as it improves availability and user productivity. Major aim of this service process is to lessen the adverse impact of incidents and problems on the business that are caused by errors within the information technology infrastructure, and to prevent recurrence of incidents related to these errors. Access management: Access management is the procedure to grant authorized users the right to use a service, while preventing access to non-authorised users. It is, therefore, the execution of policies and actions are defined in information security and availability management. The objectives of access management are Protecting Confidentiality, Integrity and Availability (CIA), sometimes knowing as Rights Management or Identity, Management, Security incidents and problems related to access management is discreetly recorded. Access management ensures that users are given the right to use a service, but it does not ensure that this access is available at all agreed times. This is provided by availability management. Event management: In this process, effective service operation is dependent on knowing the status of the infrastructure and detecting any deviation from normal or expected operation. The objectives of event management to provide the entry point for the execution of many service operation processes and activities. Additionally, it provides a way of comparing actual performance and behaviour against design standards and Service Level Agreements. Other aims include the ability to detect, interpret and initiate appropriate action for events, basis for operational monitoring and control and the entry point for many service operation activities, offer operational information as well as warnings and exceptions to aid automation and supports continual service improvement activities of service assurance and reporting. Event management can be applied to any aspect of service management that needs to be controlled and which can be automated such as configuration Items, environmental conditions, software licence monitoring for usage to ensure optimum/legal licence utilisation and allocation, security and normal activity. Scalability: Service organization can be adapted for any size of organization. Reduction in costs: Service organization has established its value in reducing the overall cost of managing services. Improved quality: Service organization helps improve the quality of IT services through sound management practices. Alignment to standards: Service organization may well align to the ISO/IEC 20000 Standard for Service Management. Return on Investment (ROI): Service organization helps IT organizations demonstrate their return on investment and measurable value to the business. This helps establish a business case for new or continuing investment in IT. Seamless sourcing partnerships: Outsourcing, often with multiple service providers, is increasingly common today and service organization offers a common practice base for improved service chain management. To summarize, business companies are continually involved to enhance their performances in order to compete actively in the market. Service industries manage and market their operations and services differently from manufacturing products. It is established that providing excellent and quality customer service is a crucial factor in an intrinsic capable market environment between the product and service industries. Service operations can be grouped into many industries, such as banking, hospitality. Most services industries which provide clients what they need and are satisfied. This helps the company to enhance its market share, and generate more profit. Service operations provide certain intangible services that may not be easily recognisable.